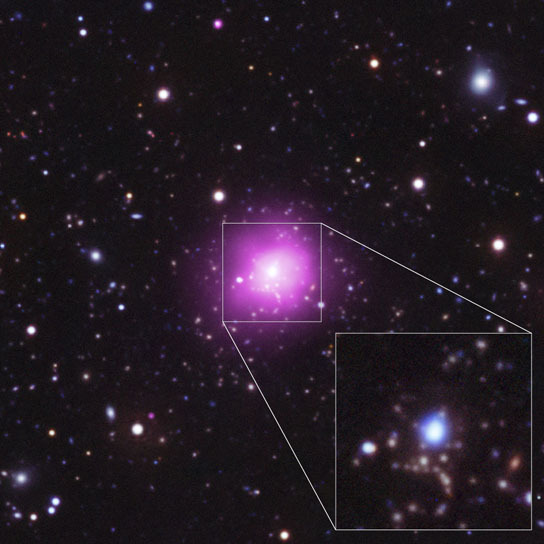 Located about 5.7 billion light years from Earth in the Phoenix constellation, the newly discovered galaxy cluster, officially known as SPT-CLJ2344-4243, has been dubbed the “Phoenix Cluster” because of its remarkable properties. Washington — Astronomers have found an extraordinary galaxy cluster, one of the largest objects in the universe, that is breaking several important cosmic records. Observations of the Phoenix cluster with NASA’s Chandra X-ray Observatory, the National Science Foundation’s South Pole Telescope, and eight other world-class observatories may force astronomers to rethink how these colossal structures and the galaxies that inhabit them evolve. 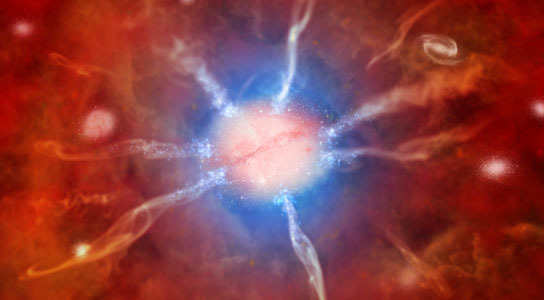 The frenetic pace of star birth and cooling of gas in the Phoenix cluster are causing the galaxy and the black hole to add mass very quickly — an important phase the researchers predict will be relatively short-lived. The Phoenix cluster originally was detected by the National Science Foundation’s South Pole Telescope, and later was observed in optical light by the Gemini Observatory, the Blanco 4-meter telescope and Magellan telescope, all in Chile. The hot gas and its rate of cooling were estimated from Chandra data. To measure the star formation rate in the Phoenix cluster, several space-based telescopes were used, including NASA’s Wide-field Infrared Survey Explorer and Galaxy Evolution Explorer and ESA’s Herschel. 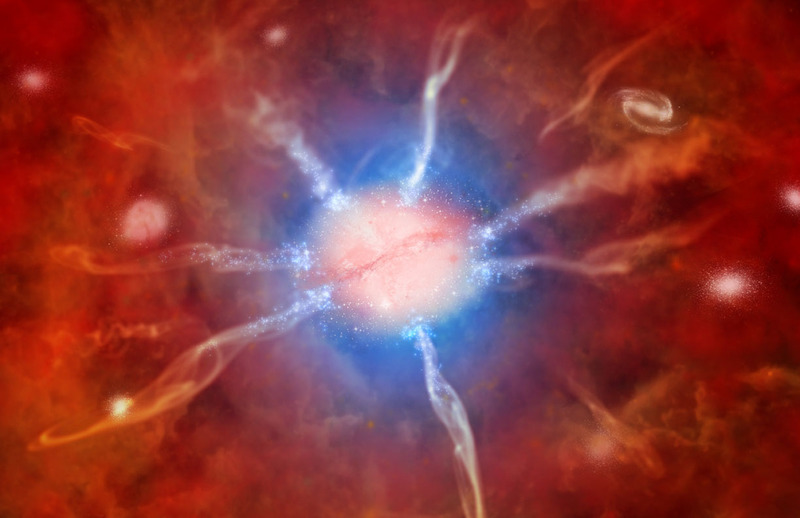 Be the first to comment on "The Newly Discovered Phoenix Cluster is Breaking Cosmic Records"